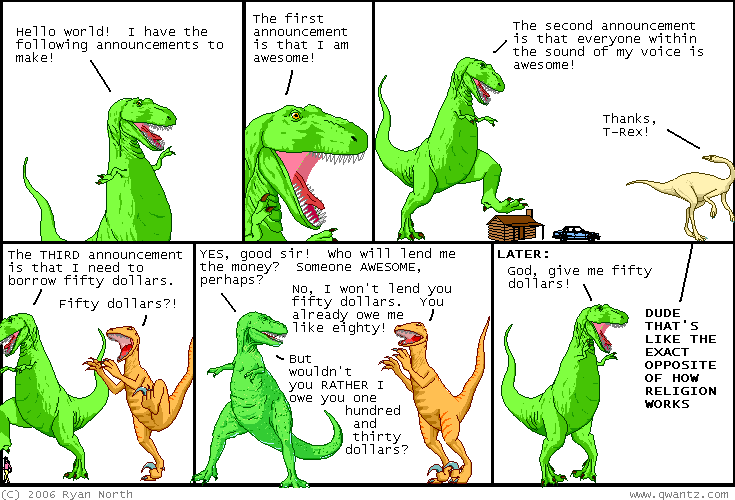 Dinosaur Comics - August 17th, 2006 - awesome fun times! –So here's how to get started on eBay! August 17th, 2006: Hey, do you program in Ruby? A lot of people do! Leonard Richardson, who not only wrote Dadasaurus Rex and the Dinosaur Comics Nethack patch AND bought me the most expensive AND most delicious peanut butter sandwich I've ever had (or, really, ever imagined) wrote a book called the Ruby Cookbook and it's been getting good reviews! ALSO: one of the examples features a certain T-Rex that readers of this comic might find COMPELLINGLY FAMILIAR. So if you're in the market for a Ruby book, I would totally get this one!